2. Practice doesn’t make perfect, but it works wonders. When pondering things I learned this year, I started to think about how I’ve made playing piano a bigger part of my life. I’ve been taking lessons since third grade, and after graduating high school, I never thought I’d continue. Then I started taking lessons with Laura Peterson at St. Bonaventure. I’d practice for my lessons once in a while, if I thought to, but I didn’t really put too much effort into it. Instead of practicing Bach or Schumann or whoever I was supposed to be playing, I’d play Fiona Apple or Regina Spektor. I played in a bunch of recitals, and I prepared increasingly more for each one. This year is my fourth year of playing at Bona’s, and I feel like I’ve improved so much. Now, instead of playing pop songs in the practice rooms, I’m warming up, playing scales, tinkering out chords, repeating hard spots. I’m working really hard. I think it’s paying off. At my last recital, my other music prof told me he had never seen me play so confidently. That felt great because I knew that I was confident. It’s all due to practicing. 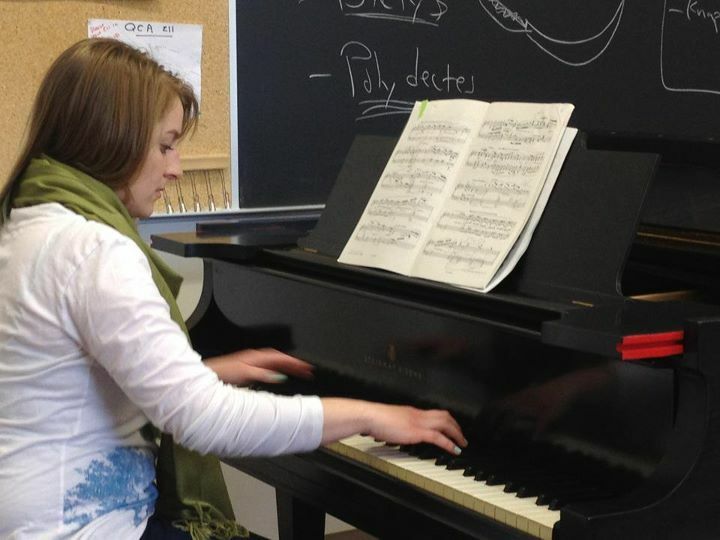 Pete took this photo of me practicing Chopin in the Quick Center. Inspirational, it is great to see some so self motivated! I love Regina Spektor; I get so excited when I get some new sheet music of hers and anticipate learning it. I find, that at my low level of skill, learning to play right through a loved song is very satisfyng. I really would like to practise and aim higher this year though!